The Corp battles the mysterious ring slayers who outnumber them 100-1. Back on OA, Salaak send for reinforcements. Problem is they won’t arrive on the planet fast enough to save John and company. 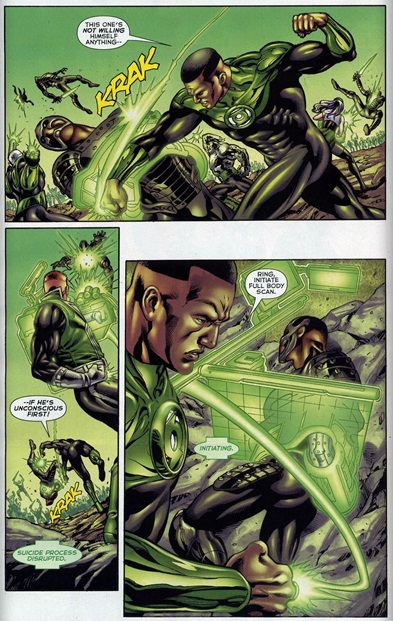 One lantern with teleportational powers decides to use his powers to teleport the reinforcements their but his powers may not be able to handle the mass. He does so anyway and John and company get help which turns the tide of battle temporarily. John captures some of them but they will themselves to die. He knocks them unconscious so he can at least get a prisoner for interrogation. The teleporter is over extended and bleeding from the eyes and nose, he uses the last of his strength to teleport everyone back to Oa and out of harm’s way. 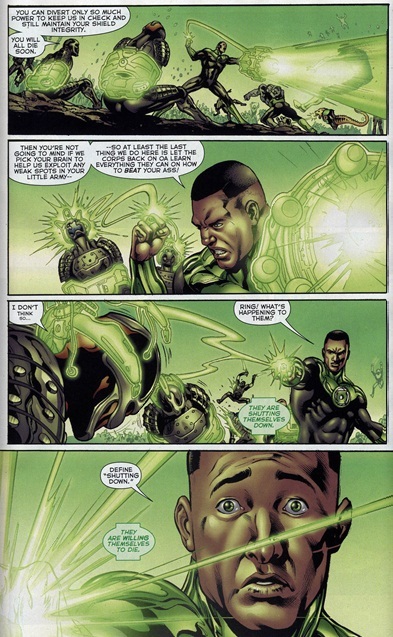 It doesn’t work however and some lanterns including John Stewart are left behind with the enemy closing in. Guy Gardner back on OA cradles the dyeing teleporter in his arms and vows to save John. Art- Dynamic colors and solid pencils courtesy of Geraldo Borges and Gabe Eltaeb respectively hit the right notes in a book where Green is the dominant color. Story- This war hot off the heels of the Green Lantern War is pretty awesome. Who are the ring slayers? Why are they doing all these things? 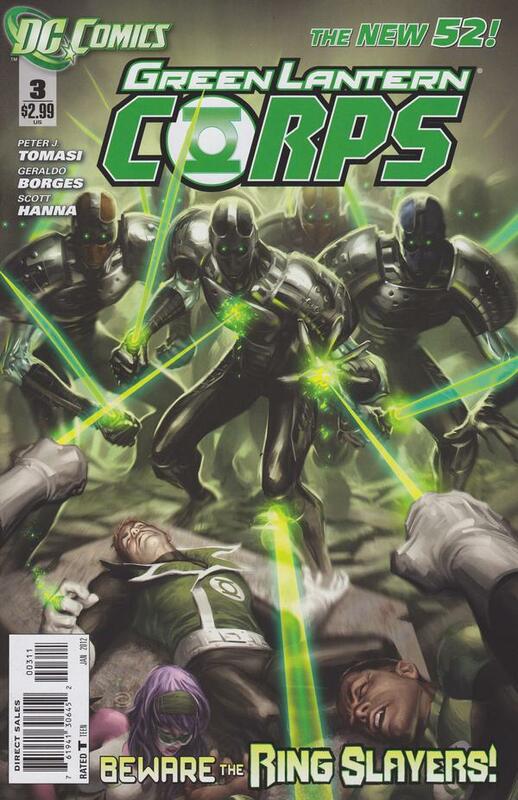 And why are they able t resist the power of Green Lanterns and use their will in ways highly reminiscent of the corps? All questions we can’t wait to see answered! Action- If you find Static Shock, Batwing and Ultimate Spider-man too slow paced this is your book! All out action with hardly a moment to catch your breath! Cover– Courtesy of Alex Garner comes this beautiful cover with the enigmatic and mysterious Ring Slayers standing over the defeated bodies of the Corps. All action- Personalities take a back seat in this action heavy book. It will be interesting to see how how Peter Tomasi handles the personalities after this war concludes.